The Bidibidi Refugee Settlement is located in Northern Uganda and is the world's second largest refugee camp at 250 km², hosting over 270,000 South Sudanese refugees who have fled the ongoing civil war. 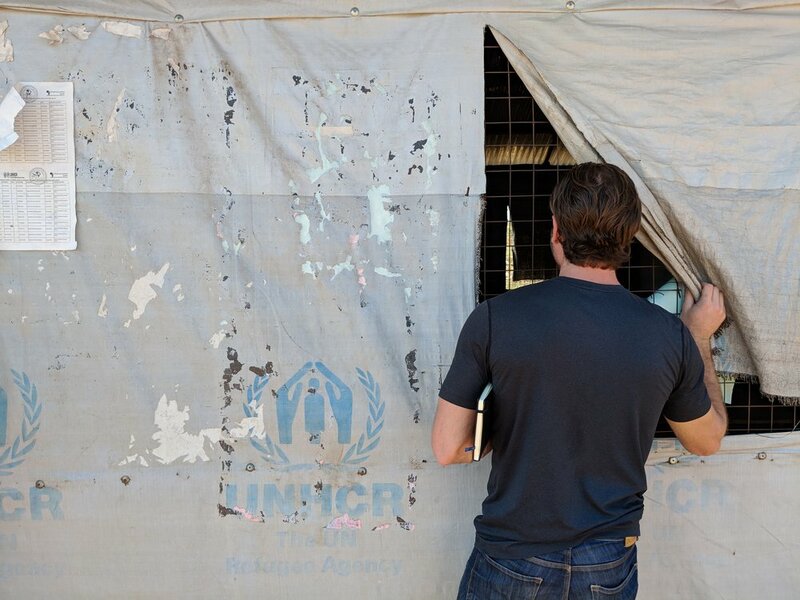 Driving into the settlement is comparable to what one would imagine: UNHCR Tarpaulins, World Food Programme tents distributing grains, and UN workers and trucks busily moving around. The roads of the Settlement are rich and red from the clay in Northern Uganda and on either side of the roads, you will find the most beautiful clay huts. Each with a different thatch roof style and varying patterns, textures and colours representing differing South Sudanese cultures and customs. Seeing these beautiful huts, and the families sitting outside cooking and spending time together helped to prepare the TWSB team for our first meeting with Twajiji Primary School. However, months of preparation couldn’t have adequately prepared us for what we were to experience. Twajiji Primary is one of 19 Primary schools in the Bidibidi Settlement. It has 3600 students and with a 1-262 teacher to student ratio. The Brighter Future Initiative collaboration with the United Nations High Commissioner for Refugees (UNHCR) involves initiating our solar-powered solution (The BrightBox) first at Twajiji, and to provide the school with our proven curriculum approach, to equip the school with a computer lab, and to serve as a charging station for the lifesaving medical device, the CRADLE VSA. Prior to implementing our model, we always meet with the schools/communities we will be working with. We do this to gain a deeper understanding of the community; to understand their local and social norms and to understand the ecosystem we plan to engage in our holistic program. We do this to better understand the problems they’ve identified first-hand and to validate if our approach can provide value to the barriers they face as a community. In recognizing this approach, we scheduled a meeting with community members from the Twajiji Primary School prior to our arrival. We requested their Headmaster Mr. Boniface and Deputy Head Teacher, Mr. Akenna to bring together key stakeholders from the community: Parents, Teachers, Members from the Parent-Teacher Association, UNHCR Education Officers, and community members. We expected to walk into a classroom and find 20-30 people ready to hold our first meeting. We were pleasantly surprised to find over 100 members from the community ready to discuss their children’s education. Following introductions, the headmasters explained why the team was there. After a two hour conversation led by Ran Sommer, our Director of Operations and Sukriti Sachar who Directs India Operations, our Ugandan Technology Coordinator, Sadati Mulilo demonstrated our technology-education solution. Sadati, plugged in the Raspberry Pi Microcomputer and set up the teachers with tablets to establish Twajiji’s first computer lab. He connected the tablets to the Pi’s Intranet and showed how they could connect to the educational content now available through it. 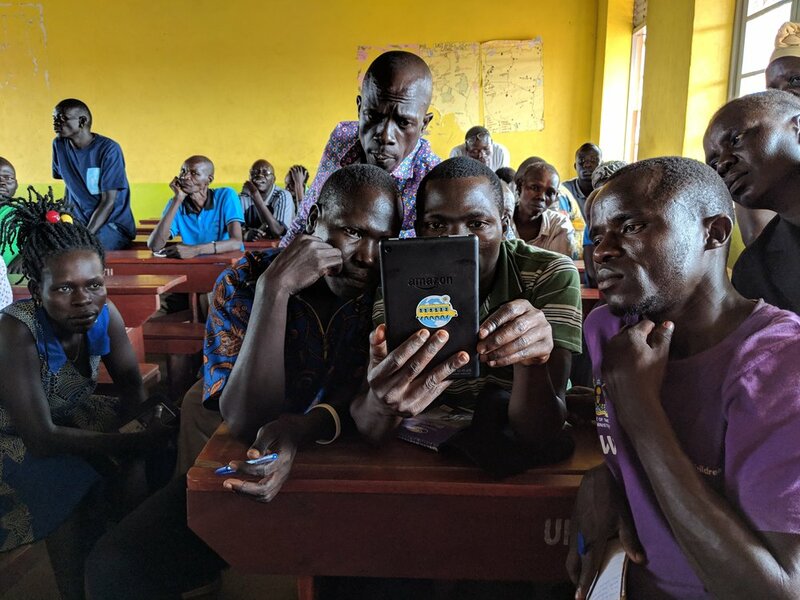 He streamed Biology videos from Khan Academy, played books on Simbi, and showed how the curriculum supplemented the Ugandan National Curriculum. Watching headmasters, teachers, parents, and students excitedly navigating the content is always awe-inspiring to see. But there was something particularly special about this, in understanding the thousands of people who will be impacted by the Brighter Future Solution. Recognizing that our small investment in solar and technology would provide 3600 students with access to quality educational content is overwhelming. On one hand, it’s incredible how far a $10,000 investment can go. On the other hand, it can be frustrating in knowing how many people can benefit from this and how many more can be impacted with additional resources. What excites us the most is realizing that our tiny device provides an educational social safety net. It provides quality content including everything from Khan Academy, TED, Wikipedia, Simbi, thousands of books, and much more. Today, we live in a world where we have the technology to bring quality education to remote regions and ensure that the opportunities we’ve been given are not restricted to the random lottery of where we were born. Following a successful session at Twajiji, our Solar Engineer arrived and setup Twajiji’s first Solar Electrical system that will be used to run the computer lab and curriculum program. The next day, we met with the UNHCR and Office of the Prime Minister of Uganda to further discuss our approach at Twajiji and how to support additional schools in the Bidibidi Settlement as well as how our approach would be rolled out at the Palorinya Refugee Settlement as well as the Nakivale Refugee Settlement. For the remainder of the expedition we continued to meet additional communities, schools, and UNHCR representatives in the Yumbe District, Bidibidi, Kampala, and Nakivale to discuss the scope of our program as we approach full implementation in July, and to establish our long-term vision in enhancing access to both education and healthcare at the UNHCR Refugee Settlements. The CRADLE devices will be safely and efficiently charged for free using the solar power that runs the classrooms. 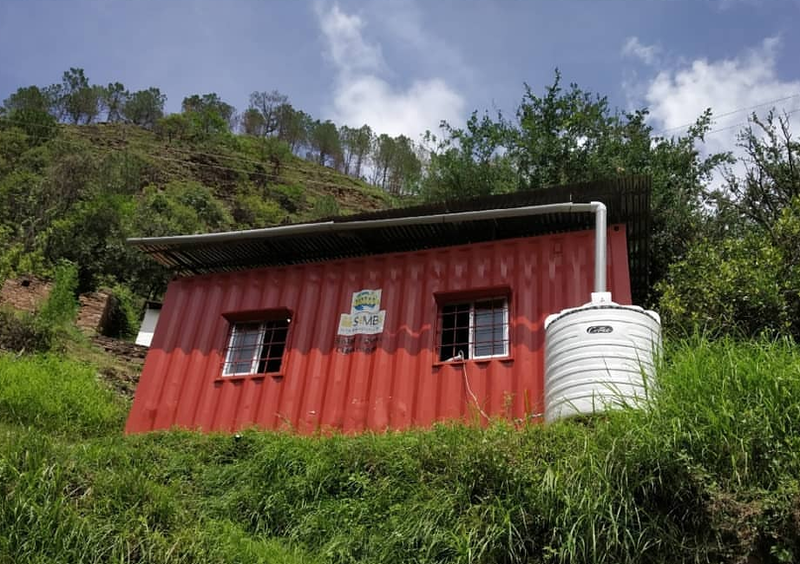 As each BrightBox will be outfitted with a Raspberry Pi microcomputer, safe storage and transfer of relevant CRADLE blood pressure data from community to Health Centres will be facilitated. The integrated and synergetic health and education solution we are applying in partnership with the communities at the Bidibidi and Nakivale Refugee Settlements is on track to impact the lives of 500,000 students by 2024. This goes to show that the holistic approach we have applied with our existing 20 partner-communities in Uganda and India has proven its scalability and potential for reach as we engage with our newfound refugee communities in 2019. 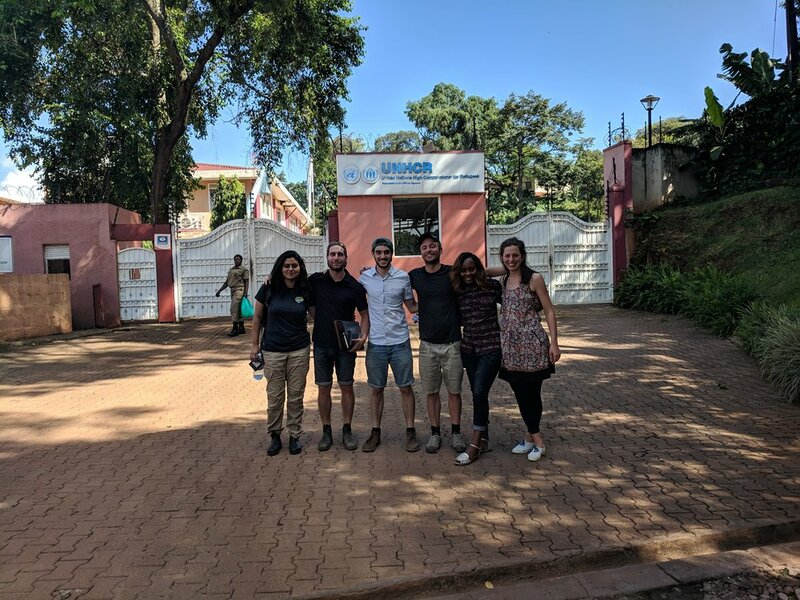 The team outside the UNHCR offices in Kampala, following a 9hr drive that morning! The opportunity to create meaningful impact is both an exciting opportunity and as we see it, an obligation. 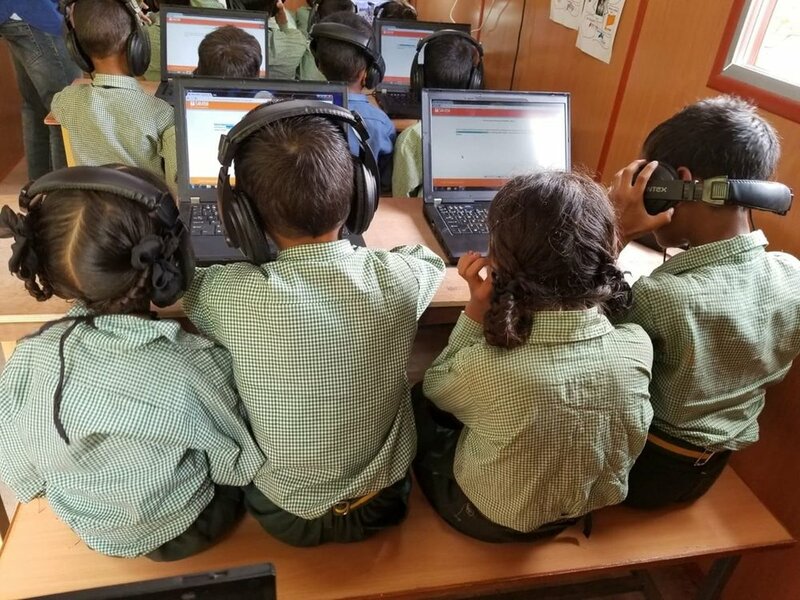 We have the tools and technology to empower the lives of tens of thousands over the next year through the deployment of our education-technology that provides and educational safety net. We are honoured and excited to work with our partners in Canada to help create this impact. We look forward to sharing with you the progression of our program as we approach full implementation in July 2019, and especially look forward to exhibiting the impact of our program with our new partner-communities in Uganda. Learn more about the Brighter Future Initiative and get involved! The words ‘The Himalayas’ has always brought up images of snow-capped mountains, gushing streams, sadhus in caves, mountaineers climbing up Mount Everest, and bright fat apples glistening boldly on rows of trees. Now, however, the same words bring up wonderful and varied images --- of young people brainstorming in a warm little log-cabin over thyme tea and hot puris, of road-trips across pine-scented hills, of small and shy, greenish-pink apples that one can pluck and relish…ah, so full of taste, of resilient and cheerful children running up slippery slopes to come to school! The Himalayas to me now is a world that is waiting to tell young people how important—and easy— it is to be progressive and still live in sync with Nature. One of the best things I did in 2018 was to join The Himalayan Expeditions organized by The Walking School Bus. My reason to be on it was to work in tandem with illustrator Ruchi Shah and her art students to write a children’s book that would showcase a life skill. My surprise was that I learnt so many skills – including how to make Kumaoni raita. My joy is that I met amazing people, and saw and experienced a part of India that was is different from the part I live in. India is a country of stark contradictions and fascinating diversity. I live in Bengaluru, a cosmopolitan, south Indian metro in the state of Karnataka. The Himalayan Expeditions was in the Kumaon region of the state of Uttarakhand, which literally means ‘Northern Land’. Bengaluru is renowned for its educational institutions. Aspiring students flock here from across the country and beyond (causing the city to burst at its seams, but that’s another story!) Education in the small villages of Uttarakhand is a challenge---the difficult terrain is just one of the reasons for this. 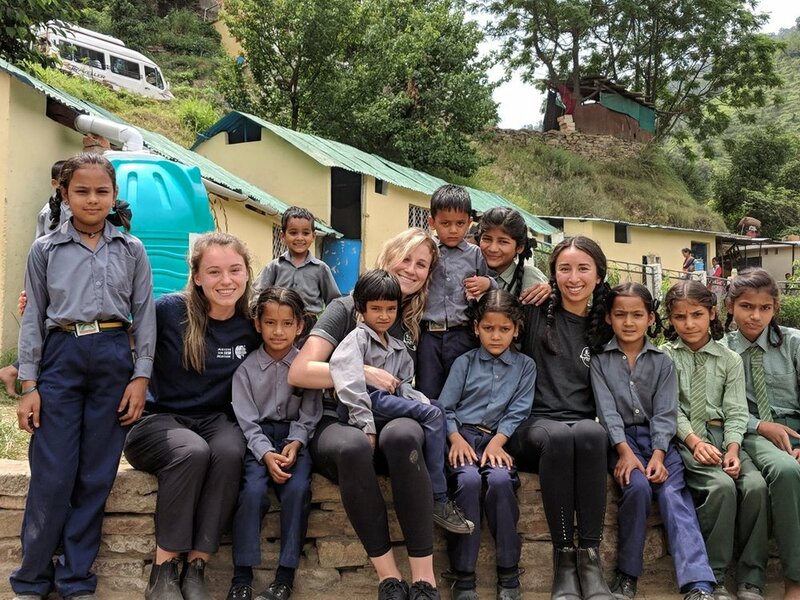 That young men and women from Canada have made it their mission to help make education more accessible for the children here is heart-warming. 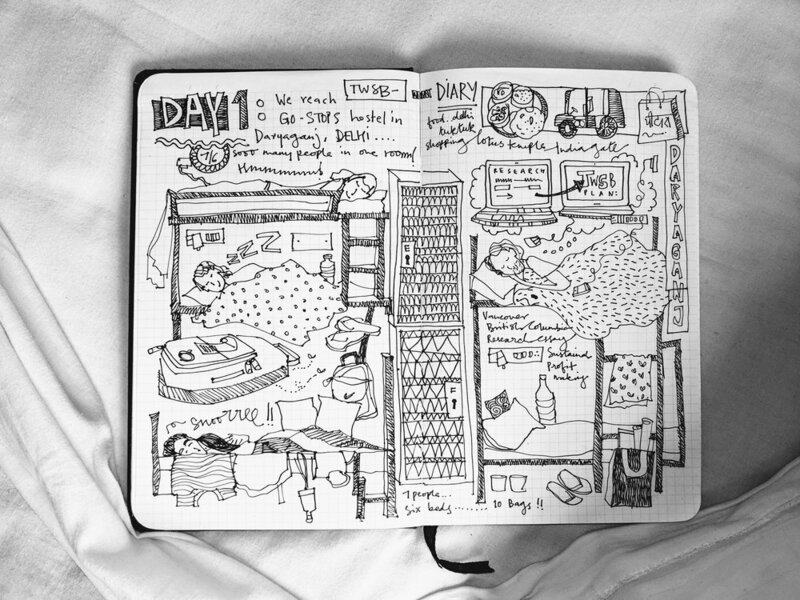 Like all journeys, an expedition like this teaches you as much about yourself as it does about a new place. It shows you the endearing warmth, humility and resourcefulness of the local people, their struggles and triumphs. It also opens your eyes to the incredible beauty of a land and how important it is to protect it. As you sit and watch the horizon, you can see a layer of hills behind the green one…and ah, another behind it. And oh, is that ANOTHER behind that? On clear days, one can catch a glimpse of the snow-capped mountains, and at other times you can see the hills shrouded in mysterious mist. As I sit and write this piece at my Bengaluru table, a thousand moments flash before my eyes…of a group of young Canadians discussing new technologies, of me braiding my new friends’ silky blond hair for the first time, of the students of the Himalayan Public School singing a beautiful welcome song for us, of them listening to stories using the SiMBI technology, of Aaron doing cartwheels and Ran and Sukriti practising kickboxing, of eating hot bhajyas by a riverside eatery, of Ruchi getting a group of children to draw a tree, of Mr.Brijmohan, the selfless headmaster, serving us tea, of proud and protective locals who are striving hard to conserve the biodiversity of the land, and of people several continents away from India who believe that there are local solutions to every problem. Thank you Team TWSB for having me and Kumar with you, and good luck with The Himalayan Expeditions 2019! Apply to our February India Expedition today! Mala Kumar loves to talk to children, cats, dogs and plants. She has written several books for children. 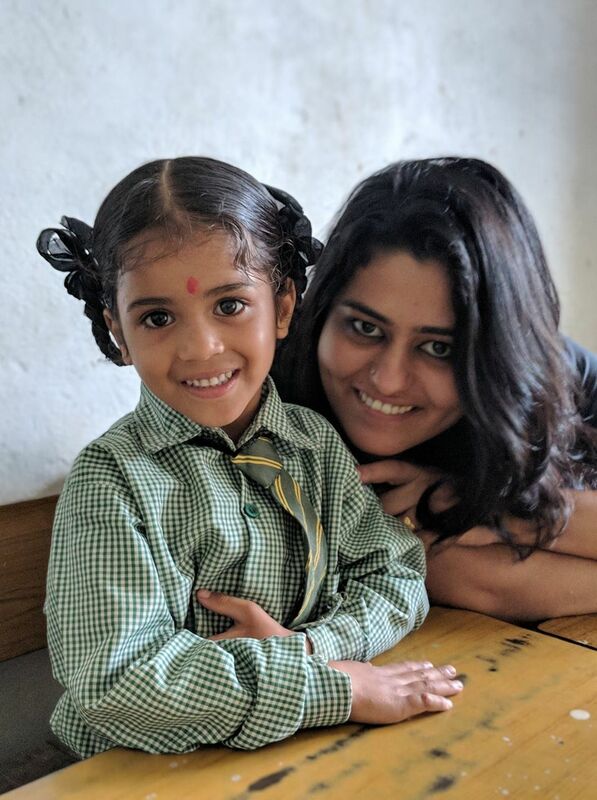 She quit the job she loved as a senior editor with Pratham Books, a not-for-profit, multilingual publisher of children’s books to allow herself more time to write, read and go off on expeditions. ‘How to solve a problem like Himani’ illustrated by Ruchi Shah and the students of The Himalayan Public School is her forthcoming book, to be published by Pratham Books in 2019. Day 1 - "Bunked up in beds"
Delhi Food tours and Tuk-tuks. 7 expeditioners crammed in a 6-person room. Flipflops, Blankets, towels and back packs. No air conditioning but a hot, happy little family. Day 2 - "The Countdown"
Beginning the day at 4am for a 6 o'clock train. 7 people / 1 bathroom. Scheduling turns for having a shower. Quick - drying towels, sipper water bottles all essentials packed! Last few cups of tea at the hostel to wake us up. Finally, 7 people, 30 bags (full of books and supplies) - to catch the Kathgodam train. Sitting in a circle, introducing ourselves. The most beautiful meeting room, against a natural backdrop. Seeing the school, the children, the solar classroom, the children, the water en-catchment - a lot of firsts! Mala (The Pratham Books author) and her thousand questions and little stories! Day 4 - "A beautiful beginning with blessings, and a bright end"
The beautiful view from our homestay rooms. Proud trees with vertical tree trunks - reaching out for the sky! Winding roads take us to the ancient Jageshwar temple complex - carved into a hillside. A short course in Hinduism followed by a traditional *Puja* ceremony. Bright, blooming flowers and brightly dressed women unwinding after a long day in the shade of a tree. 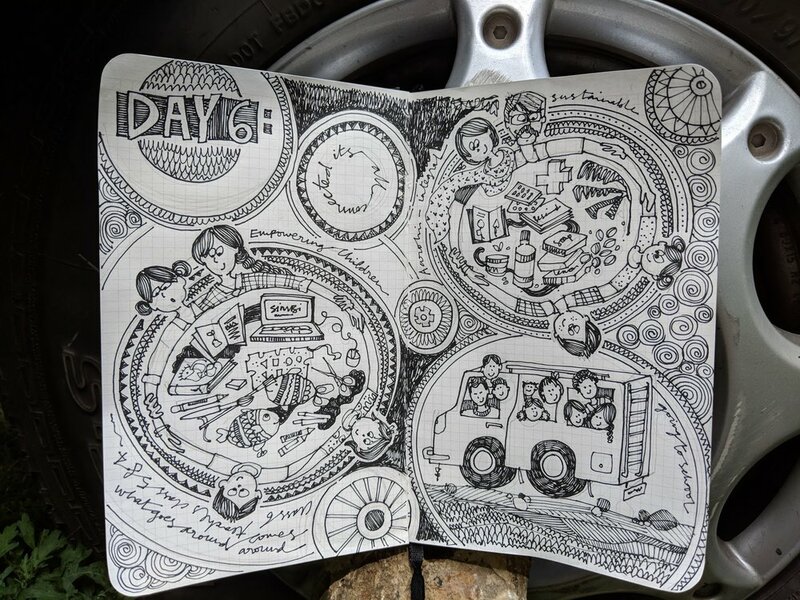 Day 5 - "Give and Take"
And early beginning to the day - surviving on Jam sandwiches and tea. Donated about 180 books for the library, stationery for all the children and awarded many scholarships to selected children. We got back hugs, smiles, waves and children very excited to begin the day! Benchmarking literacy with students - Making colored fishes during the art activity. Ending the day at Dhokaney Falls, over chips and a hot plate of Maggi! Day 6 - "It's all connected"
The older kids taught the younger kids all the art activities and helped them use SiMBi. We met 'Aarohi' a local NGO - where people from the city work together with locals to integrate health, generate business and education. This day was about how things get connected, and a circle completes. When people come together it empowers the community, helps integrate their ideas, bring an impact on holistic collaboration. The clouds descended onto the mountains making for a misty 25 km drive to school. We spotted temporary sheds, villagers building fruit crates on the roadside on the way back which was another 25 kms journey. The students and TWSB volunteers enjoyed dancing together in the rain, they also braided Steph and Carly hair in preparation for school! Artwork today was focused on putting together postcards for all the supporters of TWSB, while adding finishing touches for our 2nd Water Catchment System at the school. The day ended with a breath taking view of the valley at Mukteshwar. It was a declared holiday due to floods in Uttarakhand, making it impossible for people to travel to school or work, but TWSB decided to make the most of the day! Three of the senior students Divya, Pooja and Manasa braved the rainfall and came into school anyways and designed postcards with Ruchi. Continued transportation research interviews to discuss at financial model for a potential future school bus. A happy face drawn into a mound of cement brought a smile to our face. Its speaks about the attitude people embrace - the locals who have lived here for centuries braving hardships and enjoying the land. The day began with a long wait over coffee due to heavy rains, but nonetheless proceeded with activities. The highlight being a special assembly organized by HPS to thank TWSB for there activities, research and projects that we worked on together. TWSB had the chance to thank the students, teachers, and headmasters for their time and willingness to work with us for the entire week. The TWSB team was gifted an entire crate of fresh apples and pears by School Founder Brij Mohanji! This marked the end of an impactful expedition, spending our last day at Bhimtaal with our feet up. Today we celebrated the exciting news that SiMBi was accepted to the Accelerator Catapult program at the University of Norway! Making it possible for us to work with more schools, set up many more classrooms and create more content. After late night celebrations, a sleepy team woke up to enjoy yummy omelettes and toast. We then drove to a small pristine lake called Garudataal for the team to unwind, and enjoy its beauty. To reflect and think about the last 10 days filled with opportunity, impact, and excitement for the continued success for Himalayan Public School and TWSB. We stopped by a local 'I Heart' cafe to indulge in yummy burgers, pastas and pizzas with frozen flavored coffees after a long time. The team then arrived back in New Delhi where we said our goodbyes to each other, and moved onto our respective next locations. As humans we tend to devalue ourselves and the amount we can contribute. As a first-year student, it’s natural to have an attitude of devaluing yourself and the amount you can contribute. Often lacking the technical requirements, first-year students are told that our time for internships and research opportunities will come. My experience with The Walking School Bus over the past year has taught me that this assumption is completely wrong. There is no minimum age on the ability to add value, and I consider myself fortunate that I was provided the chance to not only show TWSB and its Leadership what I could offer, but also show myself. I was first introduced to The Walking School Bus at an event in the fall of my first year in the Bachelor of International Economics program at UBC. Impressed by the fact that all TWSB projects were supported by economic research, I wanted to get involved, and after speaking with Aaron, he immediately put me to work. My initial task was to look at the school bus model being used in Uganda, which provides additional revenue for the community by acting as a taxi when not transporting children to and from school. In researching more profitable and sustainable revenue-generation models in a Ugandan context, I also set out to look for ways to mitigate moral hazard, the economic phenomenon where someone is willing to take more risks when they don’t bear the costs of such actions. We were specifically concerned with driver actions and wanted to ensure that as TWSB partnered with more communities, we wouldn’t have to worry about stakeholders pocketing revenue or damaging the bus because they didn’t feel ownership over the costs. 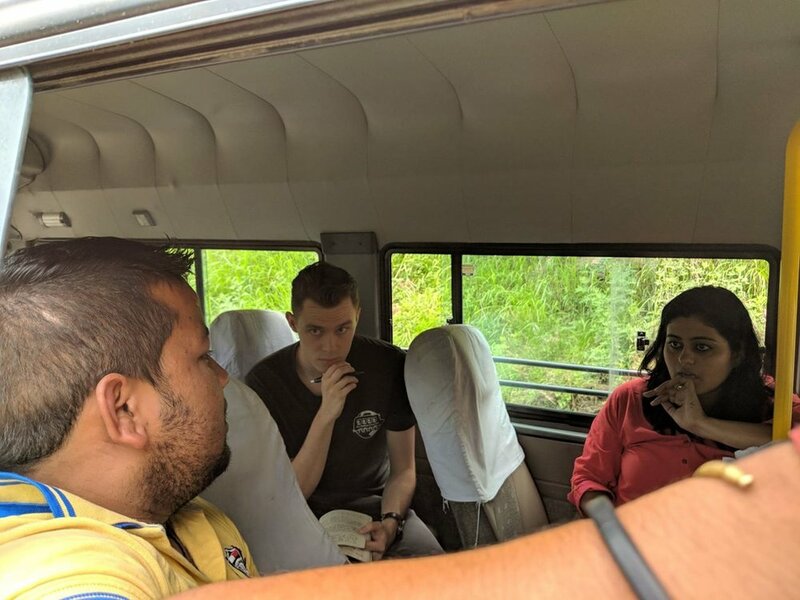 After researching the school bus model in a Ugandan context, I was met with a unique opportunity to travel with TWSB to India to work to understand if the model that has been working in Uganda could also apply in the Indian context. I was then faced with a new challenge, endeavoring to understand a new cultural and economic context where the school-bus model had yet to be applied. In the weeks leading up to the expedition, I would leverage many of the resources in my life to try and plan out various econometric models that I intended to gather data for when on the ground. I even went so far as to take an econometric textbook that I could barely understand out from the library. While I felt prepared, I was constantly nagged by the question: what can a guy with no knowledge beyond first-year economics truly offer. 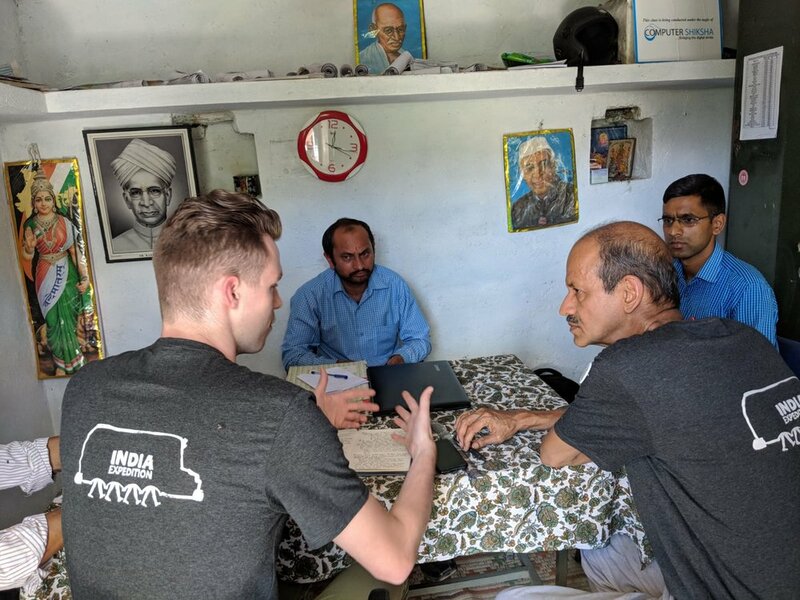 Upon my arrival in New Delhi, it began to dawn on me that my well-thought out, data-driven models might not fit the realities of life on the ground, let alone life in a country with 1.3 billion people, and I began to understand that my work at HPS Suyalgarh would require a very different approach. This was no easy task: all those doubts that I mentioned earlier came rushing back as I stared in the face of the challenge of piecing together the story of this community. At this point, I have to credit the amazing team I was able to travel to India with. Even though I was the youngest expeditioner on the trip by a longshot, I always felt that I had their confidence, and I was never treated as lesser because I’d been around the sun a few less times. Having this level of support encouraged me to eagerly dive into my work, devising an approach whereby I instigated countless interviews with community stakeholders to better understand the various dynamics and challenges existing at HPS Suyalgarh and its community. I spoke with bus drivers, taxi drivers, school staff and other community members to gain as good an understanding of the situation in the school community as possible. One important aspect of this was identifying the cultural trends and customs that would play an important role in determining whether our school bus revenue-generation model could work. The data gathered when hopping off the bus at rural gas stations or riding with the students on their taxi ride home while tracking their route, would serve to ‘colour in’ our image and understanding of the community. On the ground, research isn’t so much about data points or regression models as it is about people; the community leaders I worked with at HPS were the true indispensable highlights of my research experience. They truly opened up to me, an outsider, helping me comprehend the financial situation of the school and the customs of the region, spending hours answering my incessant questioning. While I had difficulty understanding how they could put up with me for so long at first, when the school administrators embraced me as we said our goodbyes, I realized how much faith and confidence they were placing in me, some 19-year-old economics student from halfway around the world. If I’ve learned anything from my experience working in Uttarakhand, it’s that qualifications don’t have to serve as limitations. As I go about working on my research paper in coffee shops across Vancouver, I no longer suffer from the same doubts about my work with TWSB. For each question I asked and each kilometer I covered around HPS, I gained a deeper understanding of how best to implement TWSB’s sustainable school-bus model in an Uttarakhand context, keeping in mind the specific cultural and socioeconomic dynamics which deeply impact it. What is even more promising is that there are so many isolated schools like HPS Suyalgarh in India and the world that could potentially benefit from TWSBs school-bus model, and I hope that my research can help support similar systems for rural, isolated schools like HPS. What writing this blog has shown me, and I hope has shown you, is that it is possible for one to add value no matter what their age: if you can show that you’re passionate enough and put yourself out there, even if you’re not so sure of yourself, this experience has taught me that your opportunity will come. Our final day of the expedition started again with the beautiful and temperamental weather of Uttarakhand! Upon arrival at HPS, Ruchi and Carly completed all the art related work with the students. It was a pleasure seeing the beautiful work, as well as knowing that so much of the art created by the students will be compiled and used in a storybook about HPS and TWSB! Researcher Nick sat down with Aaron and Sukriti to discuss his findings from his research on the ground. This was an opportunity to discuss the feasibility and determine the best methods of achieving an ambitious goal of establishing a school bus model with HPS in the Suyalgarh region. Our Elementary Education lead Micah completed the compilation of lesson 1 for Mathematics, consolidating the HPS curriculum with the available curriculum on our 64GB Raspberry Pi. This will be extremely helpful as the HPS teachers work to experiment and expand their teaching methods with such a resourceful tool on site. Today was our chance to finalize and fully equip the Solar Power classroom at HPS Suyalgarh. We mounted a projector screen and completed the 2nd Water Catchment system on campus! All set with data collection and safe filtering technology- very exciting and a tremendous enhancement for HPS! We held a remarkable SiMBi classroom session with some of the younger students to introduce them to our literacy program. The students had an incredible time using the computers and playing and learning through the technology and program! Finally, we ended the day at HPS with a closing assembly with the students. The Suyalgarh students sang a beautiful goodbye and thank you song, the new TWSB scholars made meaningful speeches and there was a wonderful feeling unity and impact in the air! Truly beautiful and inspiring. We finished our time at HPS with school owner Brig Mohanji, where he brought us down to his apple orchard and showed us his impressive production. As a generous thank you, Brig Mohanji offered us a massive box of apples! Quite delicious! The team completed our day at the river view where we've had so many of our lunches after our days at HPS this week. It was a time to collect ourselves and reflect on the impact we created alongside the community at HPS Suyalgarh. We spoke about the many anecdotes and conversations we had with the students, teachers and leaders. We discussed the projects we started and finished, and the data we have collected to continue our important work with our researchers back home. We can look back at this remarkable trip, remembering the massive impact that TWSB and HPS Suyalgarh will feel and remember for years to come. We are so excited for what's to come! Stay tuned! Today started with a bang with the pouring and beautiful rain so representative of the season in Northern India! A nice reminder of the essential water supply that creates the mind bendingly beautiful landscape in Uttarakhand! Today Aaron and Stephanie led the teachers in an exercise in the Solar Power classroom. We worked on SiMBi demonstrations and helped outline some of the potential lesson plans where their existing syllabus can be merged with TWSBs SiMBi and RACHEL curriculum. Researcher Nick interviewed Danesh, the school headmaster. The goal of this meeting was to work on and determine an economic model through a school bus model that best meets the needs of HPS, its current financial standing, and its future goals. From there, we completed some essential elements of the Water catchment installation. 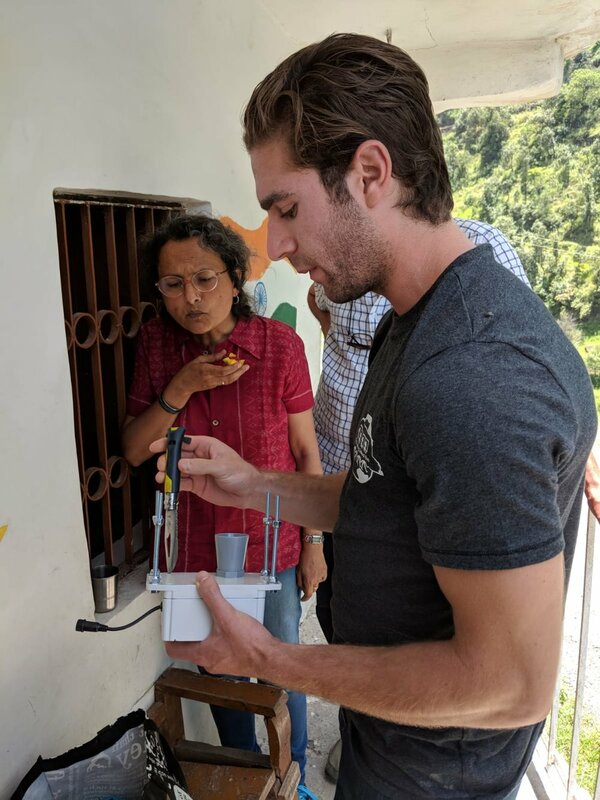 The goal of integrating the filtration system, sonar power data collection, and water catchment itself is an important collective that must work seamlessly to ensure proper and safe water (and data!) collection. From there, the team returned to the guest house for lunch. After this we had the opportunity to meet with Leaders from Arohi school in Uttarakhand. In collaboration with teachers and students, we demonstrated our technology and discussed the future potential of using and implementing our SiMBi and curriculum technology across the schools Arohi supports in the region. This is an exciting development as we continue expanding our projects in India! We called it a day with a smile on our faces as we headed to bed knowing we had one more impactful day ahead with HPS to wrap up our projects and say goodbye after an enlightening trip! Today was another remarkable day at HPS. We were excited to complete the data collection of our literacy benchmarking with our students, headed by Stephanie Markovich. This is an exceptional achievement as we compile this data to meaningfully assess the pact of SiMBi on HPS students' literacy, among ages and grades. We continued work on the Solar Power Classroom, outfitting it to best make use of the space for productive learning and literacy development. Micah Stern, our Elementary Education expert, implemented English and French lesson plans created by our Paris-based Curriculum Coordinator and Loran Scholar, Alex Gillis. Our new lesson plans cover topics ranging from pre-human history to chemistry and ensure that students enjoy informative and engaging classroom time. Empowering access to education wouldn't be possible without RACHEL, our curriculum program operated through Raspberry Pi technology. Throughout the afternoon we also enjoyed playing with the students during their recess time. Always a pleasure to relax and play with the students after working so closely with them in the classroom. As well, Sukriti led a polaroid camera activity with the students. We had a lot of fun watching the students' reaction to their photos. They had the chance to take their photos home and share with their family and friends! Meanwhile, we completed the arts and crafts exercises with the students. 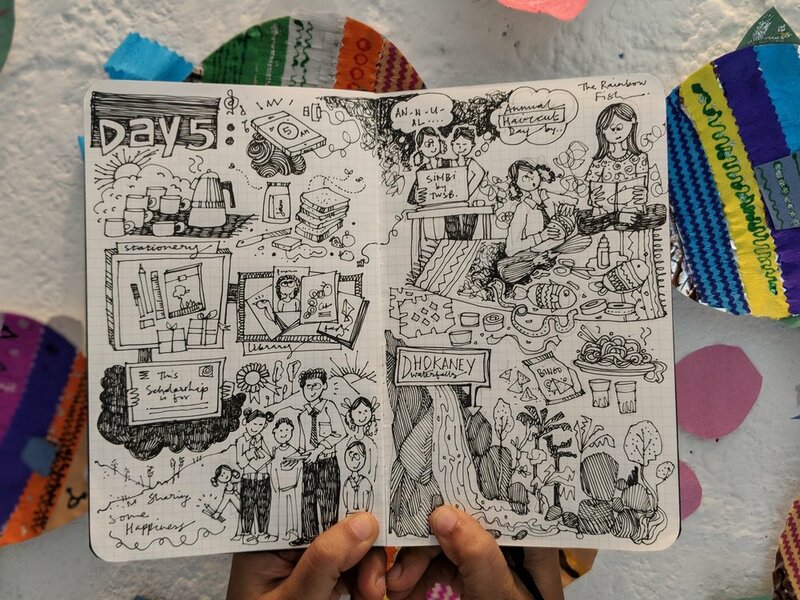 The students had the opportunity to create postcards and notebooks from their art, and had a great time using their new school supplies with Ruchi Shah's expert guidance. Another fantastic day at HPS as we work on wrapping up our research and development on the ground! 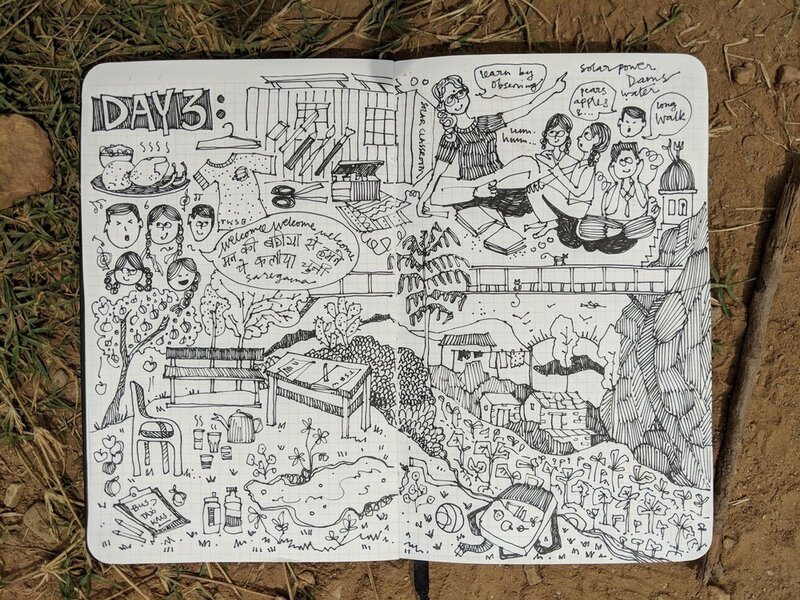 The team ended the day at nearby cafe and lookout point of the beautiful Himalayan landscape in Mukteshwar. Today was another impactful and incredible day as our research teams continued their projects. Meaningful conversations, data collection, and infrastructure preparation characterized our day! 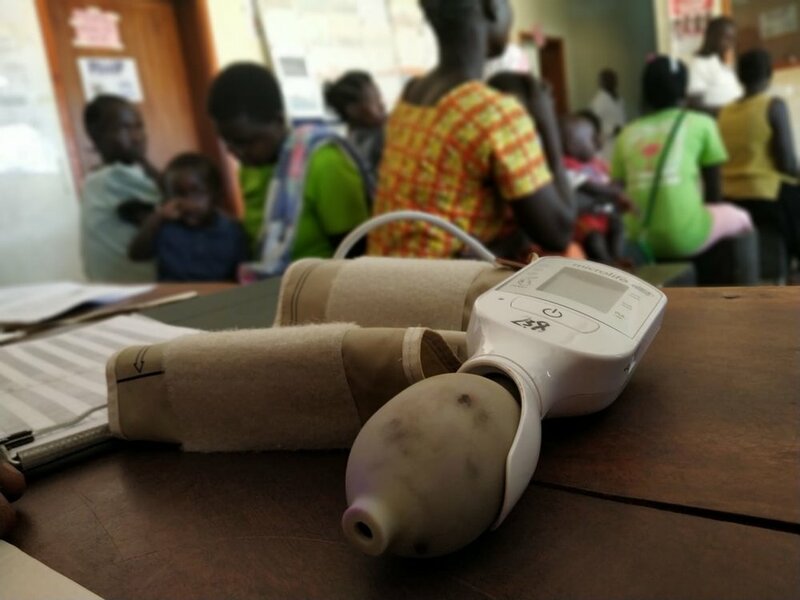 Stephanie continued to lead the SiMBi data collection through our randomized control trial. Learn more about SiMBi here. Researcher Nick took the initiative to speak with our personal bus driver for the expedition, Aneel. Initially, Aneel was confused about why we wanted to speak with him, thinking he couldn't help with our projects. Sure enough, Nick's conversations with him (with the essential translation help from Sukriti) led to extremely fruitful insights about how taxis operate in the region, affecting how a school bus model unique to Suyalgarh would be best established. This information will be imperative to our transportation research for HPS. Our Art projects continued to make headway, and today, the older students led some of the younger students in an arts and crafts exercise. The goal of this is to continue to make students comfortable with their new supplies as we prepare to work on our illustration collaboration with Pratham books. The headmaster from the Chopra Campus of Himalayan Public School stopped by to check in on our initiatives with Suyalgargh. We also were happy to hand over the school supplies for the students at the other HPS campus! We continued to work on HPS Suyalgarh's 2nd water catchment system that is attached to the Solar Power classroom. Today we completed the important work of establishing the filtration system that will ensure clean drinking water for students! Today we sat down with three of the fantastic teachers at HPS: Deepa Suyal, Pushpa Negi, and Dinesh Chandra. 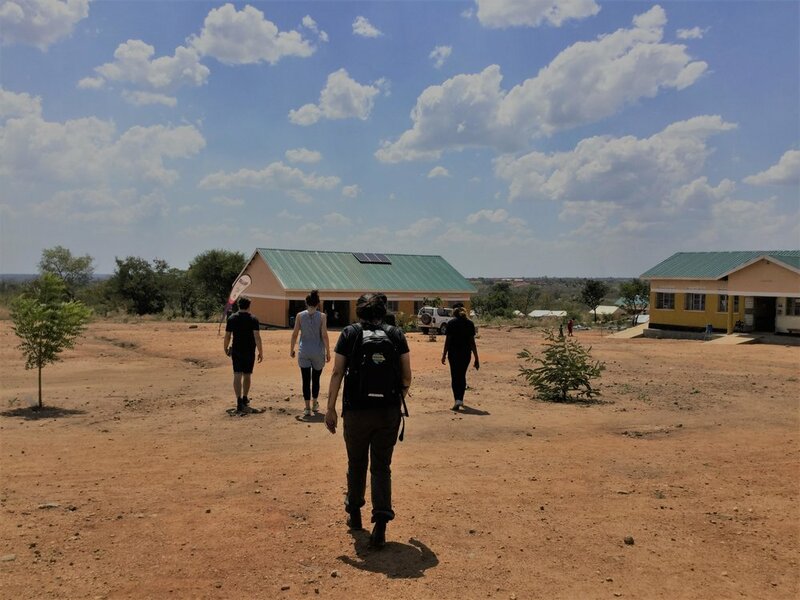 They each gave us inspiring insight in what it is like to be a teacher in the region and at HPS, as well as feedback on how the introduction of SiMBi and the Solar Power classroom has had an effect on the student culture at the school. Stay tuned for further insights from these conversations as the interviews are released! Lastly, Nick ended the day by taking the bus home with the students of HPS! Using the map provided by the HPS headmaster, Nick was able to track and make notes of the journey to get a better understanding of the terrain and distances that are used on the existing route. This will also provide essential information to inform our transportation research! When the students take a day off for their weekend, that gives the TWSB Expedition team some time to explore our unique and historical surroundings! 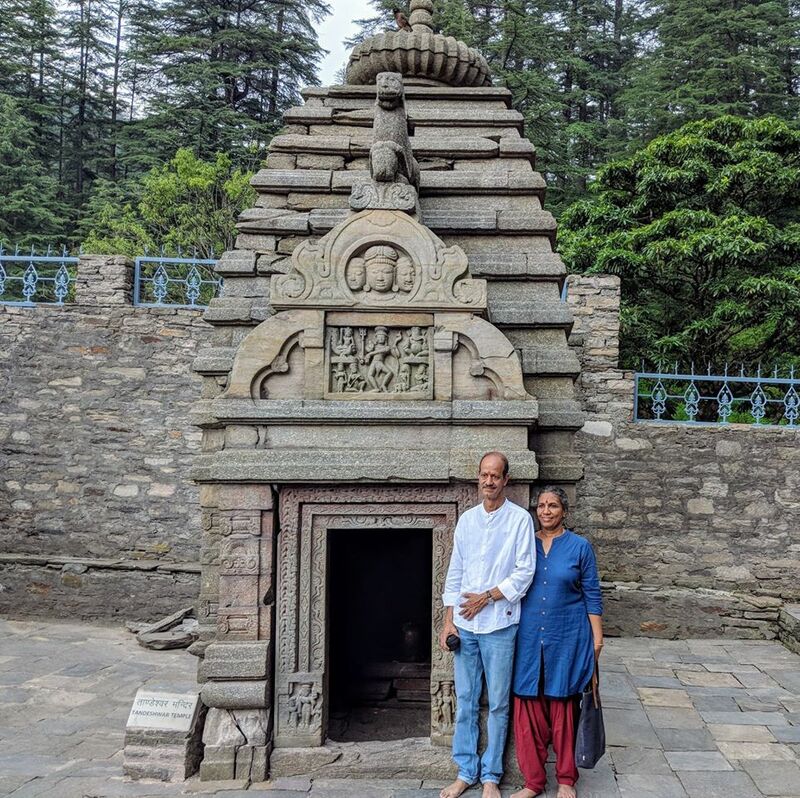 The team spent a special day exploring the ancient Jageshwar temple. We learned and saw some impressive sights. Upon our return from the excursion, the team spent time preparing for our busy week ahead! Returning to the Himalayan Public School on Monday was a special experience. We started our day with an unforgettable assembly by the HPS students in the campus courtyard with the beautiful hills of Uttarakhand as a backdrop to their strong and united performance. The assembly consisted of the organization of students by grade, morning prayers, a patriotic song expressing gratitude towards their land, and the Indian national anthem. The commitment and focus of the students was especially unique and memorable! After the assembly, the TWSB team took the opportunity to present the Indian TWSB Scholars with their scholarships. We were proud to award six high-performance students with well deserved scholarships that will provide a year's long tuition. Our next goal is to be able to provide 5-year scholarships to 15 students, based off of $12/month per student tuitions! We also had the privilege of contributing over 150 Pratham books to the HPS library, as well as stationary kits for every single HPS student at both campuses in Suyalgargh and Chopra (151 students!). The response from the students and teachers was overwhelming, and the enthusiasm was a great start to another collaborative and productive day. Again, our specialty teams went their separate ways to work on our various projects at the Himalayan Public School. Our Art Director, Ruchi Shah, together with Expeditioner Carly led some of the younger students in a crafts exercise based on the "The Rainbow Fish" storybook to get them comfortable with using their hands for art. We will be relying on the HPS students' artistic abilities for the creation of the future book by Pratham Books. UBC Economics Researcher, Nick Williams sat again with the HPS Headmaster and School Founder to iron out more details regarding the existing HPS financial model and the long term feasibility of a school bus model. Our hope is to establish a school bus model unique to Himalayan Public School that can meet their needs and enable an economically feasible revenue stream to sustain and grow their existing operations. Communications Director, Ran Sommer had the chance to sit down and speak with the new HPS Scholars and learn more about their background. It was an opportunity to understand how these exceptional students were able to get to such a point where they exhibit leadership to their peers and commitment to their education. Tremendous insight was uncovered during these conversations and it was a treat hearing their positive feedback on SiMBi and the Solar Power Classroom! Keep your eyes peeled for these exciting interviews! Throughout the day, Micah Stern, an Elementary School Teacher and Researcher spent her time solidifying her understanding of the Uttarakhand curriculum and syllabi that is used by the teachers and students at HPS. This process is extremely valuable as we begin aligning the curriculum loaded on the TWSB Raspberry Pi. Stay tuned on the progression of this important work! 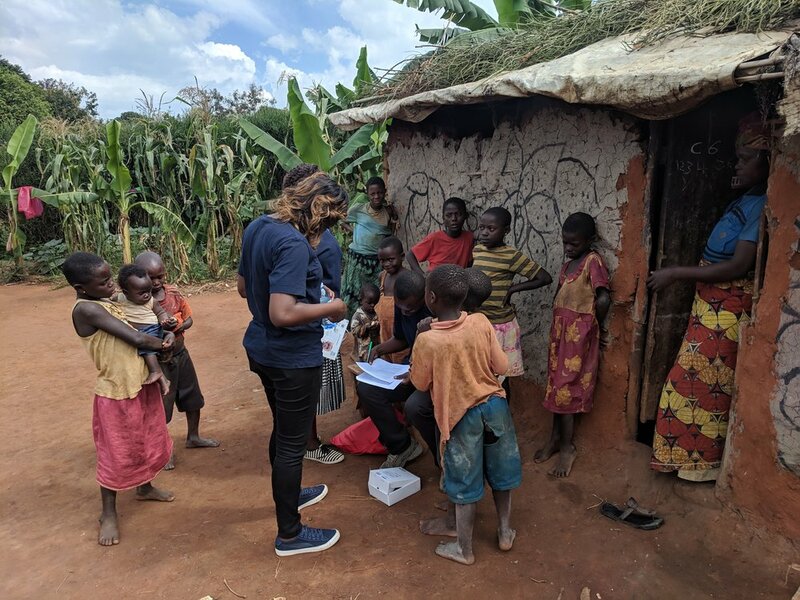 Director of SiMBi Operations, Stephanie Mracovich spent her day collecting data on the literacy rates of some of the students who have used SiMBi over the last few months. Over the next few days she will continue collecting and consolidating this data as we determine the impact of SiMBi and student literacy at HPS! Our Executive Director Aaron Friedland began the day with each research team as they started their projects on the ground. From there, Aaron spent time working in the Solar Power Classroom, determining ways to improve and adapt its existing operations to maximize its productivity, and to best use the space effectively. Aaron also found some time to sit with a few students to test their literacy after 3 months of using SiMBi. A special moment occurred when Aaron was busy with one student, the two other students in queue intuitively opened up their own laptops while waiting their turn and chose to read SiMBi books on their own accord! Quite powerful! Our day was only able to move smoothly due to the exceptional support of Sukriti Sachar, the Director of India Operations. Aside from the massive amounts of preparation put in prior to the expedition to enact our research projects, Sukriti has acted as a translator in each of our initiatives at HPS to ensure productive communication takes place, making her presence invaluable to the expedition. Another productive and impactful day at HPS! Looking forward to the next few days as we ramp up our projects! Before heading to our guest house to prepare for the next day, our team had the pleasure of enjoying the beautiful Dhokane waterfalls. It was relaxing and refreshing after a busy day! Today we returned to work with our partners at the Himalayan Public School - Suyalgargh since we were there during our April India expedition! It was a true privilege to connect with teachers and students the week they returned from summer break! After a short tour of the campus and a check up of the Solar Power Classroom and Water Catchment system, the older students welcomed the team with a thoughtful and kind welcome song. "We made a Garland from the buds of our heart"
At the start of our Expeditions we always ensure that we calibrate the goals of our partner communities and TWSBs commitment to educational access. We took the opportunity to share introductions between HPS leaders and the TWSB Researchers and Expeditioners. Here we began aligning our research and expedition goals with the headmaster, the teachers and their teaching goals. "Mera Naam Carly" is how Expeditioner Carly would introduce herself in Hindi! Preliminary talks between UBC Economics researcher Nick and the community leaders were held regarding the potential addition and feasibility of a school bus for HPS and their students. A select few of the older HPS students were led in an art exercise, as well as introduced to the goal of creating a reading book with Storywriter Mala Kumar. 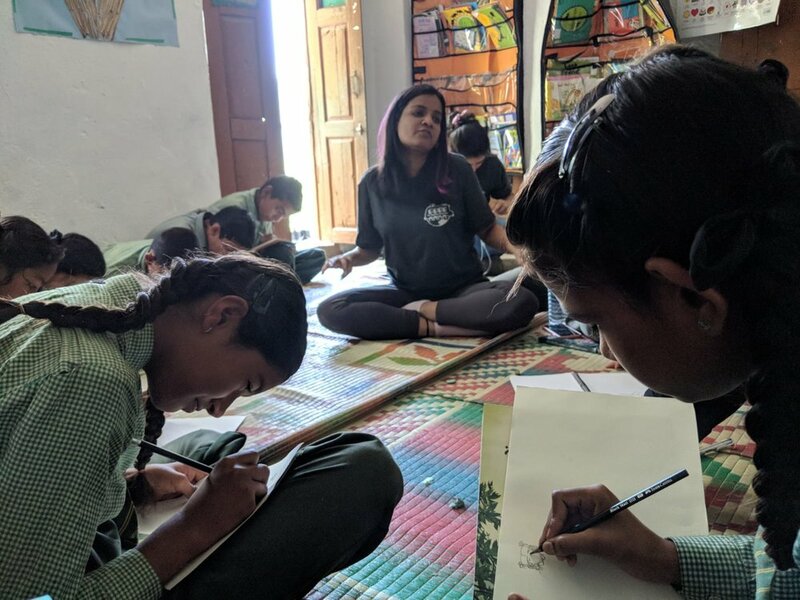 We will be using their artwork with the help of Artist Ruchi Shah, and will compile their illustrations to create a book about the Himalayan Public School that will be published by Pratham books. The technology that guides the water catchment system was tested pre-installation when we return to HPS after the weekend. From there we called it a day at HPS. We saw the students off and returned to our guest house with a strong orientation over how we will proceed with our projects, and how to adapt our preparations prior to the expedition. Today was exhilarating! It was a treat to see our projects from the April expedition being utilized. It was such a positive interaction to speak with the headmaster, Dinesh, and school founder, Brig Mohanji and hear their perspective on the mission they initiated. We have one day over the students' weekend to gather ourselves before a full week with HPS. Our task list is high, our goals are ambitious, and our team is motivated. The teachers and students have generously welcomed us with trust, and we will return the gesture with purposeful and committed research and collaboration. Such a thrilling first day at the school, and we're excited to hit the ground running on Monday Morning! Our small but talented team arrived at our guest house in Uttarakhand, 30 minutes from the Himalayan public school which we will visit on Day 2 to begin our collaboration with the heads of school, teachers, and students. You can feel the excitement in mountain air. We are surrounded by beauty near the Himalayas, and our Indian experience so far has only been one of wonder, taste, and comradery between our budding group and the locals we have met along the way. We are looking forward to what Day 2 brings. Stay tuned! 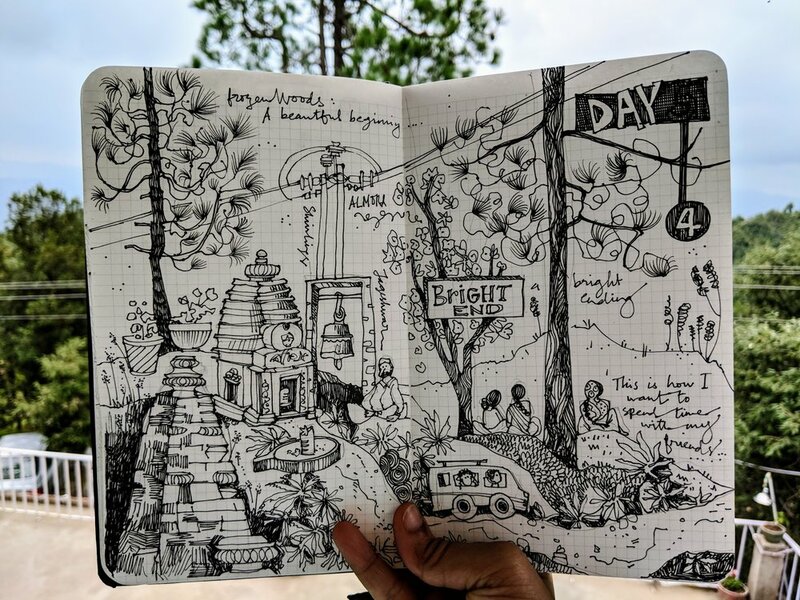 Everyone who has followed our story knows how the TWSB India Team quickly formed and within months had helped to raise awareness through our first ever Access In Motion Walk and first India Expedition. The India Expedition was something I had thought about when I first volunteered in Uganda with TWSB, owing to the similarities in the two places. That one thought, Aaron’s drive, and all the right people enabled us to fast-track the initiation here. The India Expedition was something I had thought about when I first volunteered in Uganda with TWSB, owing to the similarities in the two places. 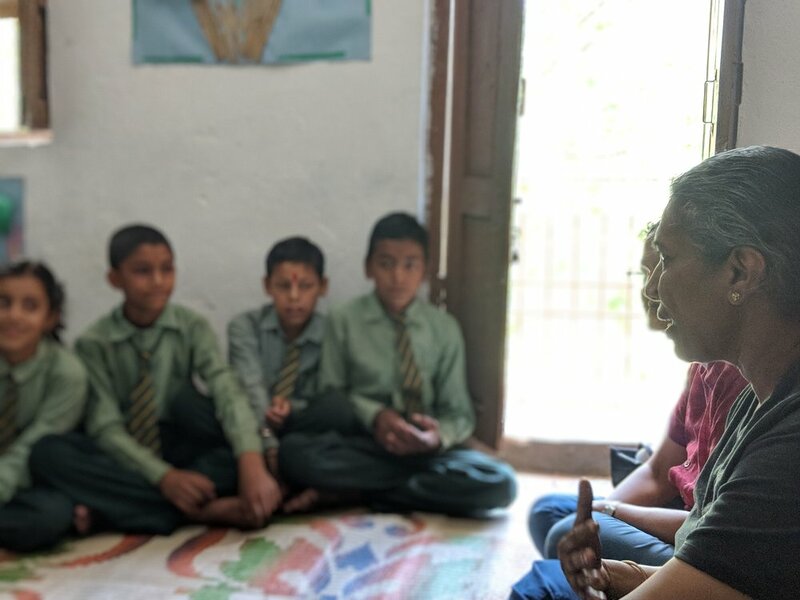 We met the most helpful individuals to start off – Dr. Sushil who locally heads another non-profit in Uttarakhand who introduced us to Mr. Pankaj Wadhwa, who in turn, helped us find the right schools to partner with. Something you should know about Uttarakhand- every person there understands the importance of Education and the ability to access it. And in Uttarakhand, we found Himalayan Public School, a small private school with a big personality. Brijmohan Joshi started this school with 30 students eight years ago, and today, his vision and passion have grown the school to 150. During our very first visit to the schools, Aaron and I felt strongly about partnering with this team of hardworking people. We had found the right place, the right partners, and were now looking for the right workforce - people who would understand that this project was our first in India, that there would be challenges and that we will need all hands on deck. The power does lie in working together. One could plan all they want, but the success of the project depends on what happens in the field. We were fortunate to find the most reliable team members to join us from five continents, ranging from students to dentists to business owners to researchers. Digi-Aid even joined us, the winners of "Search for Jugaad," to integrate their research work with our reading programme. It was a diverse group with one goal - to empower access to education. Nobody needed to know the same language to connect with each other. Everybody pushed their boundaries, and it was beautiful to see Expeditioners integrate and become one team with the community. The students at the two Himilyan Public Schools were as enthusiastic as we were. We constructed water catchment systems at HPS Suyalgarh and HPS Chopra. We were able to collect the distance data to help determine the impact of a School Bus. We conducted art workshops with Ruchi Shah, a brilliant book illustrator and now, our art director! We have plans for the art pieces created by the students. Most importantly, in our first expedition, we were able to install one of our Solar Power Classrooms and reading technologies. However, before implementing the tech and classroom, we collected data to better understand our impact. I don't think we quite understood the impact the projects had on the entire community there until the very last day. But any effort that is initiated but not followed through doesn't hold for long. 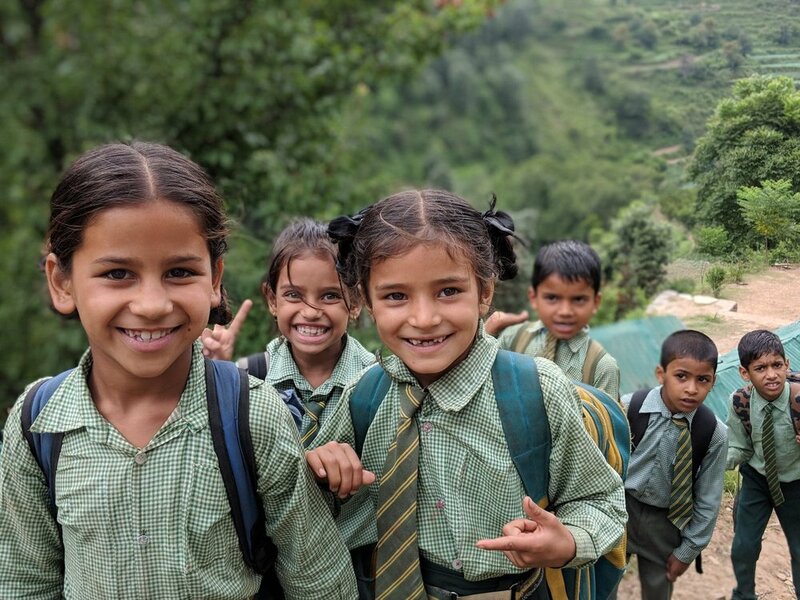 Our projects at the Himalayan Public Schools have only begun and we are excited for what the future has in store. So, WE ARE GOING BACK - July 6th- 15th,2018! And we couldn’t be more excited! We will be post-testing to see the results of our executed projects, building a library and water catchment system, continuing with our art initiatives, and so much more. As a bonus, we have the opportunity to work together within the scenic hills of Uttarakhand! So, why does anyone volunteer? Most people have an underlying need to feel better about themselves. A few may try to make the surroundings more conducive to ensure the future generations have it better. A handful, however, can work with others and create opportunities for communities that need them. Let’s remember, individual evolution brings about communal evolution. New Addition to the Team! The Talented Ruchi Shah joins as Art Director! Over the last 2 years, Ruchi Shah has become an integral part of TWSB, here is an infographic that explains her remarkable journey with us! 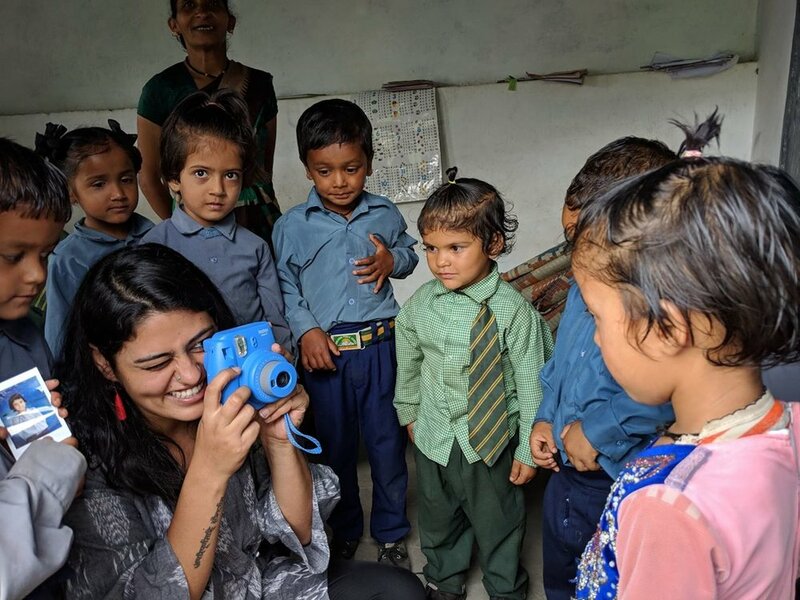 Just 350 km away from Delhi, in a village that barely has 100 homes, a team of 20 volunteers partnered with the Himalayan Public School. What we have been able to achieve in a week’s time along with the local teachers is nothing short of spectacular. At HPS Suyalgarh, the solar-powered classroom is all set up and the SiMBi reading program is up and running. The students and the teachers were very eager to begin using the program. It was wonderful to see and hear them reading along with the passages recorded by volunteers around the world. A few members of the team embarked to HPS Chopra to set up the water catchment system, and to compile the information from the children’s questionnaires regarding their commute to the school (e.g., distance traveled, means of transport). These questionnaires have provided invaluable information and will help TWSB facilitate their transportation requirements. The HPS Chopra students were proud to show off their academic skills while working on the Polaroid activity, and they were excited to have personal pictures taken of themselves. Students verbalized and wrote down their family members, what they want to be when they grow up, some of their favorite foods, and more. 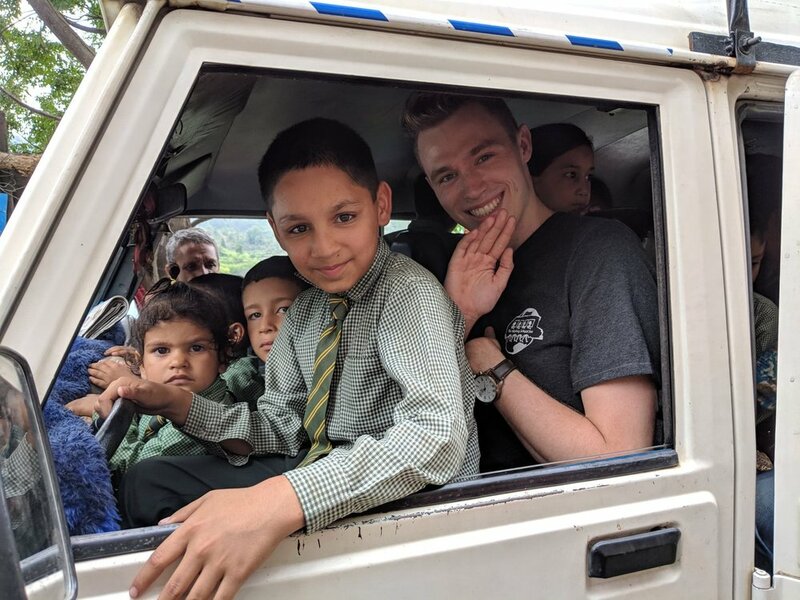 This activity provided our team an opportunity to further our meaningful connections with the children as we found we had many similarities. Following the activity, the worksheets with the students’ pictures were hung on the classroom walls for all to see. After our visits to the schools, several members of our team went for a swim at the Dhokane Falls, while others chose to hike near our guest house. We sadly had to say a tearful goodbye to three of our amazing team members: Aaron, Ishita, and Suneeta. The new members were excited to finally meet the children. It was wonderful to experience the children’s morning assembly, where they sang community songs and the national anthem on a beautiful sunny day atop the mountain. We then broke off into our individual groups in order to address each aspect of the day’s work. The water catchment system was completed today, as was all the pretesting for the reading capability project. One of the highlights of the day for the children was the Polaroid activity led by Sukriti, Shruti, and Mahima. None of the children had ever seen a Polaroid before and it brought out their naughty spirit and made for some beautiful and funny pictures. They also enjoyed sharing personal dreams and aspirations, such as what they hope to be when they grow up and their wishlists. Shari was also able to use her skills as a speech-language pathologist to assist some children with communication needs. All in all, it turned out to be a very special day at the school. After a long and rewarding day, the team enjoyed our evening playing board games and having some good laughs. This was a very special day as it was the first day that our new team joined us at HPS Suyalgarh. We were greeted by an enthusiastic team of teachers, who had graciously taken the time off from their personal day to join us to train on each aspect of the Expedition. We met with the teachers in small groups to review the SiMBi application, the solar classroom, Raspberry Pi, and the water catchment system. Further, we were able to gain a better understanding of the challenges that the teachers and staff are facing. It was incredible to witness how the teachers embraced each aspect of the Expedition and how they were excited to implement the changes into their classrooms. Following this productive morning, the team was able to take a breather (and some chai, of course) at the beautiful symbolic Chauthi Ki Jaali, a stunning lookout point where we enjoyed a breathtaking sunset. Today was incredible! While we were saddened to say goodbye to three of our astounding team mates: Dan, Sonja, and Philli; we were overjoyed to welcome Sneha, Shruti, Nishit, Varsha, Pavithra, and Kush to the group. We accomplished a great deal today in the Solar Power Classroom. 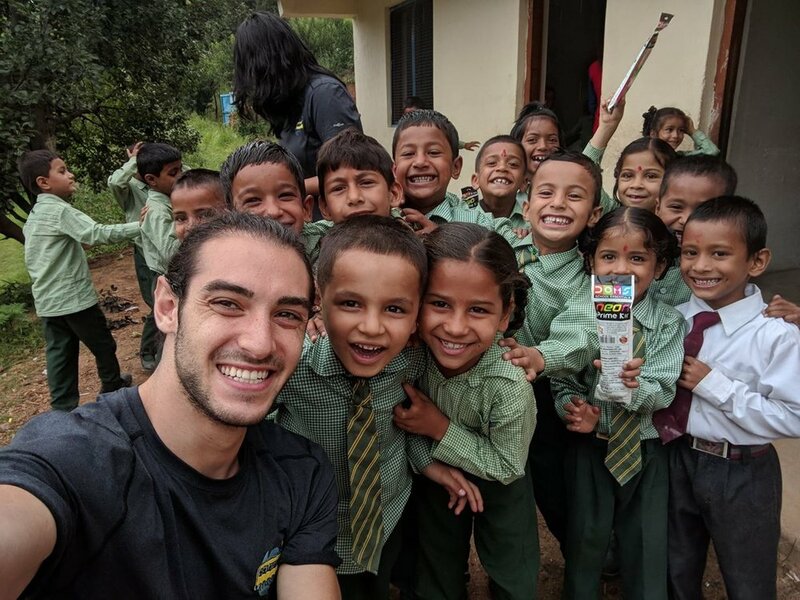 Sukriti and Aaron were tenacious in working with the locals to install the roofing and the solar panels to power the technology within the classroom. Kishan set up the Raspberry Pi intranet systems on the computers. These systems are equipped with an abundance of educational material for students and teachers, including modules designed by Kishan and Ishita. The students were immediately curious and could not resist peaking their heads in to see what was going on. We were happy to share this experience with the students. They definitely beat us in the smiling competition. Although the heavy down pouring rain required our team to adjust our afternoon plans, we were thankful to retreat to the guest house, bond as a group, and you guessed it, drink masala chai. Aaron, Sukriti, Dan, and Tushar left for HPS Suyalgarh early in the morning to oversee the delivery of the solar powered classroom. 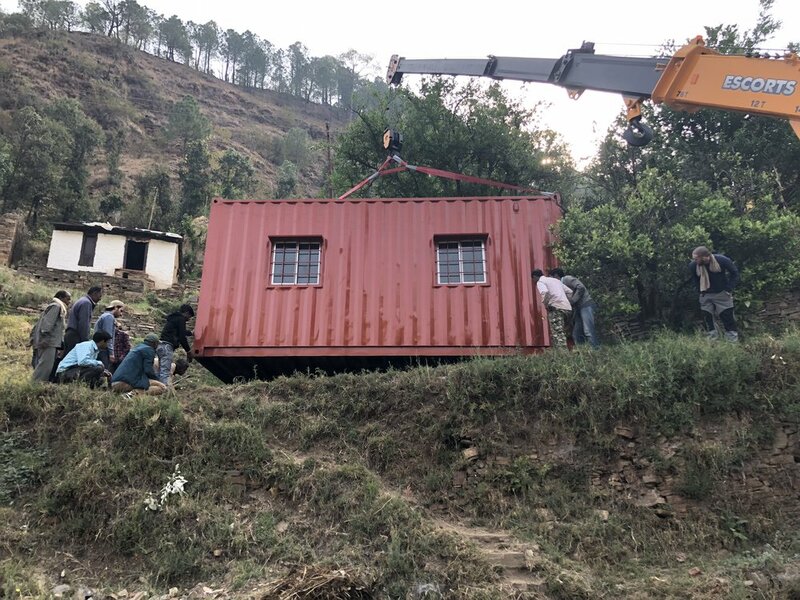 The remainder of the team arrived after breakfast to see the shipping container already in place and continued the previous day’s projects. Dan and Emma began preparing the space for the water catchment system with the help of the school’s founder, Brijmohanji. Before establishing the school 8 years ago, he worked in agriculture. He offered his vast knowledge to demonstrate an innovative method for working with available materials (string, sticks, stones) to accomplish this task. Together they dug, leveled the earth, and measured the diameter for where the water catchment will later be placed. The bricks for the water catchment system’s foundation arrived and the team applied the Ugandan way of tossing to transport the bricks from up on the road down to the ground near the classroom. Brijmohanji and his wife generously invited us to share a meal in their home. The vibrant house was built over 200 years ago and has been passed down from generation to generation. We were thankful for the opportunity to be a part of their daily lives as we assisted in the preparation of the chapati for the meal. We were immensely grateful to deepen our connection with Brijmohanji today – after all, our work is grounded in collaborative relationships. Following the day’s projects, we hiked to a nearby waterfall and went for a swim to relax and cool off. This morning, we ventured for the first time to Himalayan Public School (HPS) Suyalgarh and began our day with introductions and an orientation of the school. Needless to say, we were eager to begin the projects. With the support of Ishita and Sunita, Shari conducted the reading pretests with class 5 and 6 students. These pretests measure students’ current reading levels and will better our understanding of literacy rates as students use SiMBi over time. Geared towards improving student literacy, SiMBi is an online reading resource that teaches students from kindergarten to high school using a combination of phonics, sight words, and fluency drills. Sukriti and Kishan administered distance surveys with various classes for the purpose of comprehending the journey students take to get to and from school each day. Ruchi, accompanied by Philli, Sonja, and local self-taught art teacher, Mahima led students in an art project. The students huddled around Ruchi with genuine engagement and concentration as she explained their task. Moments like these are invaluable to teachers and Mahima is really quite lucky to have the opportunity to teach these students every day. They drew imaginative patterns in wax crayons and applied watered down paint to allow their crayon designs to emerge. These pieces, in addition to others created in the upcoming days, will be collected for the book Ruchi is producing in collaboration with TWSB and Pratham Books. Philli captured the student’s artwork. Her sincere interest in each student allowed them to feel proud of the work they accomplished – this was very apparent by their smiling faces as they lined up to take a picture. After a day of hard work, the team stopped for chai and returned to the guest house where we were welcomed with another tasty traditional meal. We concluded our evening dancing to popular Indian music and watched the lightning storm in the distance over the hills. It was remarkable to see months of effort finally come to fruition.